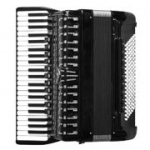 Awesome Accordion Blog by Shelia Lee: accordion tips & tricks, lessons, free scores and more. Blog is designed for the Beginner to Advanced Intermediate Accordionist whom desire to embellish their current accordion performance level. Shelia Lee's Accordion Blog | Accordion Playing Made FUN! News of Black Diamond Accordions' activities, plus all kinds of other interesting and amusing accordion-related photos, videos and more. Great accordion blog. Every week there is a new cover played on the accordion. Jense Meek invites all kinds of guests to play and sing along. Accordionistic brings a fresh approach to accordion music.